Winter arrived for the dinner meet providing some hairy driving conditions on the Friday night. The last person in the bar was Sara, delayed after a collision with a deer at Glen Coe. The caring side of the EMC came through - is the deer all right? Is your car all right? Are you all right? The mixture of hotel and bunkhouse accommodation had made the sleeping arrangement permutations a bit more complicated. We had a couple of folk dropping out on the Friday so the game of musical beds continued and in the bar I rearranged things AGAIN. This meant Richard and Anne C swapping beds from hotel to bunkhouse on a theoretical basis for the fifth time and great confusion for the hotel owner as Anne had already checked in. At least it meant that Richard could get a hairdryer. Most confused was Owen who thought he was arriving to share a twin room in the hotel with Richard but ended up in a twin in the bunkhouse, first with Anne and then, later that evening, moving to share with pensioner Broon who insisted on staying put. 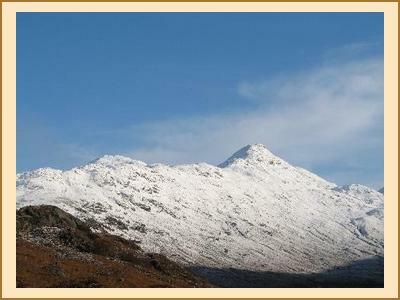 On Saturday the hills were looking picture postcard perfect, plastered in snow with blue sky. With hindsight we might have got on better using mass attack tactics instead of dividing up into teams of 2/3 as we all struggled to make progress in deep unconsolidated snow. Even Duracell bunny men Fraser and Richard didn't fully complete their respective double munro objectives. Margaret, Gillian and Sara were helped by the timely appearance of a member of the mountain rescue team who helpfully broke trail for most of the way up their corbett. There is no truth in the rumour that they were deliberately lagging behind to make sure they didn't catch him up. After 3 hours and probably another 1.5 to go to the summit, Kenny and I gave up on Sgurr Dhomhnuill which was to be my 201st corbett. Eileen was also eyeing up two new corbetts but she and Bill gave up after the first one. 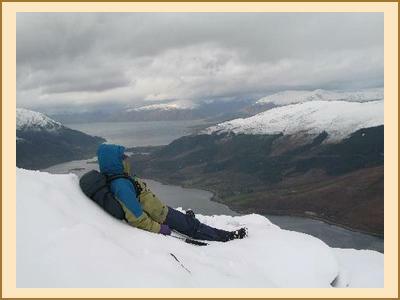 Eileen was later informed by Kenny that she had already done both corbetts with him a mere 25 years previously. In the evening we were joined by Alison W straight from Edinburgh Airport. In rushing to grab her bag at the airport Alison assumed that she would be the only passenger arriving in Edinburgh from Addis Abbaba with an Exodus holdall. Suffice to say that her "fellow" exodus passenger from Livingston was none too pleased to discover that his holdall was now at the Corran bunkhouse. Dinner was enlivened by Jenny getting a complimentary bottle of red wine to compensate for the red wine that was knocked over her. Some folk will do anything for free drink. It was also enlivened by the appearance of a ghostly shell suited figure with cigar. Fortunately Sir Jimmy stayed in the public bar. Sunday was looking fairly wild and most people had had enough of the snow conditions and just headed home. Alison W had to get back early for a date with Mr Angry from Livingston. Sara needed to get back for a new wing for her car. Kenny, Alan and I did the Pap of Glen Coe. Nice views but hard work. Back at the cars we bumped into Hamish MacInness out for a wee leg stretch and Anne R bumped into Sir Jimmy at the tea shop in Ballachullish.